Eldon promised our grand-girl Jillian horse riding lessons this Fall and the day finally arrived! Love Jillian's dirty little farm boots! Off they go to get Promise. That's her tucked back in the woods out of the heat. She's pretty much always happy for attention, so "catching" her is not usually a problem! As much as I wanted to stay and watch, I didn't. I went back up to the house... it was Grampy and Jilly time. Although Rosy was with me and she kept insisting that it was time to go for her horse lesson! When I came back an hour later, Jillian was doing great. Watching Promise, listening to Grampy. She was "clicking" and holding her reins and not clinging to the saddle horn. Eldon said he taught her how to "bale" in case of emergency, so they demonstrated it for me! Jillian loved it. "Thank you, Promise. You're a good horse". And then she said, "I never knew horse riding lessons could be so much fun"! Rosy had a couple minutes of "lessons" and she was done! Promise is a special horse to us and her story is very interesting. I wrote about her this week where I blog for MaryJanesFarm. You can read it here! September is drawing to a close and there is a little bit of a Fall feel in the air. I'm not ready... how about you? The first time we drove by I thought it was an antique shop and I could hardly wait to get back and do some shopping! I had been saving my pennies for some clothes shopping but I immediately thought, "I'd far rather buy junk". But when we went back the next morning I discovered it wasn't a junk sale, it was someone's amazing collection. I had the courage to stop with my camera one afternoon and I thought surely if I just take pictures from the road it won't be trespassing. Although there were no trespassing signs, but I still felt sort of strange taking pictures of someone's yard. But I switched to my zoom lens and got started! About that time a truck came rumbling up and an old man stuck his head out the window and said, "Go on in and look around. Take your pictures up close". So I did! At first look from the road, it appeared like a conglomeration of junk. But once I got in the yard and really spent some time looking I realized that there was a method to his madness. He had collections of things that were incredible. Obviously, being on the coast like it was there was a lot of ocean paraphernalia. My husband was mesmerized by the antique outboard motors. He had those motors lined up on the fence in perfect display. Notice the old reels hanging above. The crazy thing is that everything had it's place. In a very interesting way. I want this old water spigot for my yard. And signs? Oh my goodness, did he have the cool signs. I loved the old meat grinders hooked on the porch railing! Oh my word. I love that green, chippy paint! There was just about every cool junky thing you ever wanted! In reality, it's probably a good thing I'm married to a man that doesn't love junk. Because I think I'd be dragging home a bunch of stuff like this! I recently made these Batman costumes for two little boys for their birthdays. But I had to have models to make sure they fit and, conveniently, my grand-girls are the same age so they got to be the models. This is what I ended up with when it was time to take them off! I guess little girls like to be Batman too? The real reason I'm even writing about this is because of the memories involved. You see, my son Logan (who is now 29 years old now) loved Batman. I purchased this pattern from McCalls and made him his first Batman suit when he was two years old. Unfortunately, that was just the beginning. I have proof in the fact that I have the above pattern in sizes all the way up to 10! I made him a new suit every year. (I also made them for his friends and his cousins too!) Logan came up with ideas every year to make it better. He would sit in the chair next to where I was sewing and he would say, "But Mom, I want it like this...."
This Batman suit was not for Halloween. Believe me when I tell you that it was worn on a daily basis. We have a story of Logan, when he was 9 years old, with his first horse and it was a common sight to see him in his Batman suit riding his horse... trotting along the dirt road with the cape flying out behind him! I remember the cape had to get bigger and bigger... better for flying you know! I love things that remind me of when my kids were little. The pattern is no longer available. (Unless you purchase it used from eBay of course.) 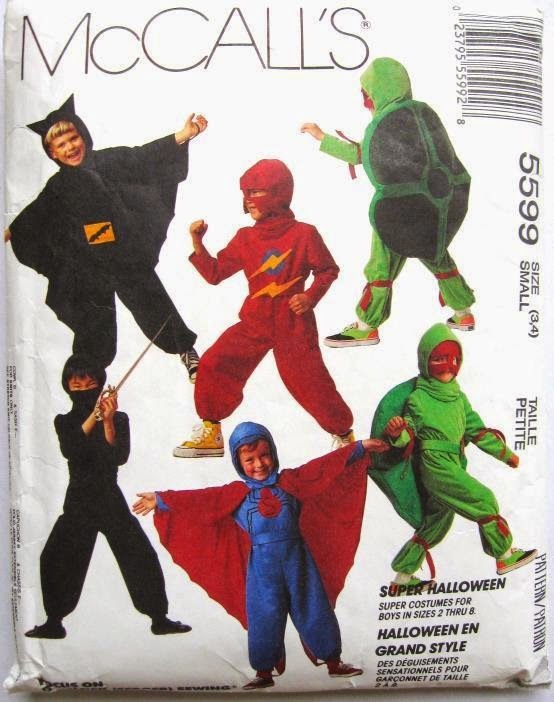 But trust me, they don't make the new Batman suits the same. This pattern is the full deal. The suit, the cape, the hood, and the belt. I designed a mask too when my son got older and said, "But Mom, I need a mask"! Jillian has the bat hanging thing down to a fine art! And Rosy totally has the pout down to a fine art! We still have a few boxes in storage and one of the boxes is my photo albums and pictures in shoe boxes.... otherwise I would've had a few pictures of my son here too! For some reason making these little Batman suits hit me pretty hard... I could actually feel myself going back in time to my sewing table with that darling little blonde boy sitting next to me saying, "Mom, you have to make the cape have little curves in it because that's how the real one is." Does this happen to you too? Where suddenly something triggers a memory so profound it takes you right back in time? I'd love to hear one of yours. I'm sure most of my readers are familiar with Mary Janes Farm Magazine? I've loved her magazine for years. This past year I started reading The Farm Girl Bloggers site brought to you by MaryJanesFarm. It's a fun blog because it is written by several Farm Girls; each writing a couple posts a month. There's the Beach Farmgirl, the City Farmgirl, the Rural Farmgirl, and the Suburban Farmgirl. They each have a complete different story to tell and it really brings a fun variety to the blog. Well... long story short I am now MaryJanesFarm, Ranch Farmgirl! I will be writing twice a month, every other Friday. I hope to write about my ranching heritage, our cattle farm here in Tennessee, and of course just day to day life happenings. Obviously, I will continue to keep my personal blog because I love it! I will also continue my Monthly Moos column because it is one of the favorites of my readers. I do not plan to write about the same things here that I will be writing about on the Ranch Farmgirl blog, so you can follow me at both places! It's an exciting opportunity and I feel so honored to be a part of the MaryJanesFarm bloggers. I didn't have the courage to share the news until my first post was live; which is TODAY! You can read it here. I hope you'll subscribe to receive posts by email so you can enjoy what all the Farmgirls have to say! I'd also like to take this opportunity to thank you, all my faithful readers who email me, comment on my posts, and have become my friends. Thanks for reading! P.S. Recently the book "Half Broke Horses" was shared with me. Have you read it? I have been enjoying it so much as it keeps reminding me of MY grandmother and her life on the New Mexico Ranch that she homesteaded. If you ever need a book to read, try it! This post is quite a bit different than what I usually write about, but I have permission to share a few pictures from a special day that I got to be a part of. This little boy is Grant. His Mommy and Daddy have waited many years for him to come into their lives. Six months ago when they got the call that the perfect baby boy was waiting for them, it was a miracle that still brings tears to my eyes. Last week I had the privilege of flying to Texas to be with them during the finalization of his adoption. Giddy with excitement as the little family enters the Courthouse. Going over the final paperwork with the Lawyer. He was such a kind man. This is Grant's precious Grammy, who just happens to be one of my very dearest girlfriends! After a bit of waiting in the hallway (where we had a lovely time visiting with other little families there for the same purpose) we got called in the Courtroom. The Judge had the most precious smile on her face as we came in. I would imagine this is the highlight of her week. I love this picture. I was actually crying behind the camera lens. I know this picture above is blurry but it has to be recorded as the moment the Judge and the Lawyer got tickled because Grant was working as hard as he could to get ahold of the microphone! His little arms were just swinging! It was actually over very quickly, but that certainly didn't minimize the impact of what had just occurred. Grant now took on the same last name as his Mommy and Daddy. Leaving the Courthouse - the family is complete. Grant's new shoes from his Grammy. Oh, they were so precious on him. And he was so darling in his little outfit - all dressed up for one of the biggest days of his little life. It was such an amazing day that I was so privileged to be able to be a part of. I will always cherish it, as I cherish the place of honorary Auntie that I get to have in Grant's life. I was there for five days and when I left today I left a piece of my heart in Texas! Little Grant has the most precious story of how he came to be the son of Dennis and Ashley and I'm only one of very many people that are overwhelmed with thankfulness for his birth mother and her love for him in wanting him to have the very best. Adoption is a beautiful miracle.